Please type in your name (or leave it blank), then click on the “Start Quiz” button below to begin. This Verse establishes that Hajj is a highly recommended, but not an obligatory, act of worship for the one who has the ability to perform Hajj. This Verse establishes the obligation to perform Hajj for the one who has the ability to do so. Having the ability to make Hajj includes having enough provisions and having the means of transportation to and from Hajj. The one who leaves off Hajj while he has the ability to perform it, while believing it is obligatory to perform it, has committed major kufr that expels a person from Islam. The one who leaves off Hajj while he has the ability to perform it, while believing it is obligatory to perform it, has committed an action of kufr, such a person has committed a great sin, but this action does not remove a Muslim from Islam. 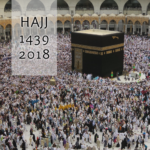 The one who dies while not having performed Hajj even though he had the ability to perform it while alive, then his heirs should use the deceased’s wealth to appoint someone to perform Hajj on his behalf. Irjaa linguistically means to “delay or put off”, and the Murjiah “put off” or separate actions from al-Eemaan. 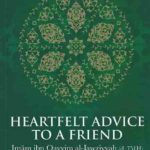 There were some scholars who fell into a type of Irjaa, they claimed actions were important, but still separate from Eemaan. This group was called the “Murjiah of the Fuqaha”. The most extreme group of the Murjiah claimed it is enough to acknowledge of existence of Allaah in order to be considered a complete Believer. This was the belief of the Jahmiyyah. 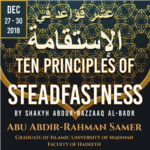 Prophet Ibraaheem عليه السلام is called the “father of the Prophets,” and the statement of Tawheed remained amongst the Prophets that came after him, and they are from his offspring. These verses mention the two pillars of the statement of Tawheed: 1) Negation: to negate the right of worship of any besides Allaah; and 2) Affirmation: to affirm the right of worship to Allaah alone. These Verses were not mentioned by the author or the explainer of the book. The permissibility of modern-day “interfaith dialogue” in which every religion is presented as something acceptable to follow and believe in as a means to enter Paradise. That whoever obeys the scholars, leaders, figure-heads, seniors, etc. in making matters halaal and/or haraam in opposition to what Allaah has legislated, then the one who does this has taken those people as lords besides Allaah. The importance of seeking knowledge of the religion, as some people declare matters as halaal and/or haraam in opposition to what Allaah has legislated, due to their ignorance of the religion and due to relying on baseless traditions. It is permissible to obey the scholars, leaders, figure-heads, seniors, etc. in making matters halaal and/or haraam in any and all situations. If the matter turned out to be in opposition to what Allaah legislated, then the blame only falls upon the leader, not the follower. Furthermore, if the leader was correct, then the follower has two rewards; and if the leader was incorrect, then the follower still receives one reward. The Messenger of Allaah ﷺ was a human being, sent with revelation from Allaah, as a mercy to mankind. The Messenger of Allaah ﷺ is described with the attributes of kindness and mercy (رَؤُوفٌ رَّحِيم) but these attributes are not comparable to the kindness and mercy of Allaah. It is not permissible to refer to a person as kind, merciful (رَؤُوفٌ رَّحِيم) as this is resembling the creation to the Creator (tashbeeh). The creation and the Creator may share a name or attribute with regards to its wording; however, they do not share in the reality of the name/attribute as the Names and Attributes of Allaah are perfect and not comparable to the creation. It is from extremism and deviance to deny the Names and Attributes of Allaah. It is from extremism and deviance to liken the attributes of Allaah to the creation. 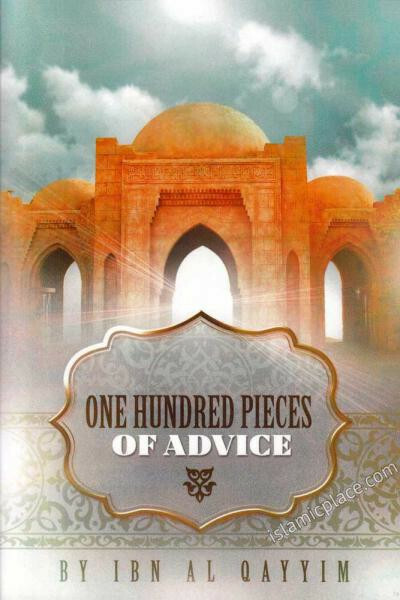 It is permissible to rely on the statements of philosophers in matters of religion and ‘aqeedah, especially if the philosophers were from ancient Greece, as they had a vast and advanced civilization in their time. That all commands from the Messenger of Allaah ﷺ indicate mere “recommendation” unless and until there is a proof that the command is obligatory to follow. To only believe in the matters of the religion that are in compliance with what people today claim to have of “intellect”. That Salaah and Zakaah became obligatory upon the Believers in year 19 AH. That Salaah and Zakaah became obligatory upon the Believers in year 18 AH. 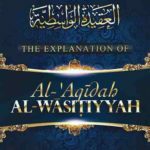 What proof did the author, Imam Muhammad ibn Abdul-Wahhaab رحمه الله, bring as a proof for the obligation of fasting in Ramadan? 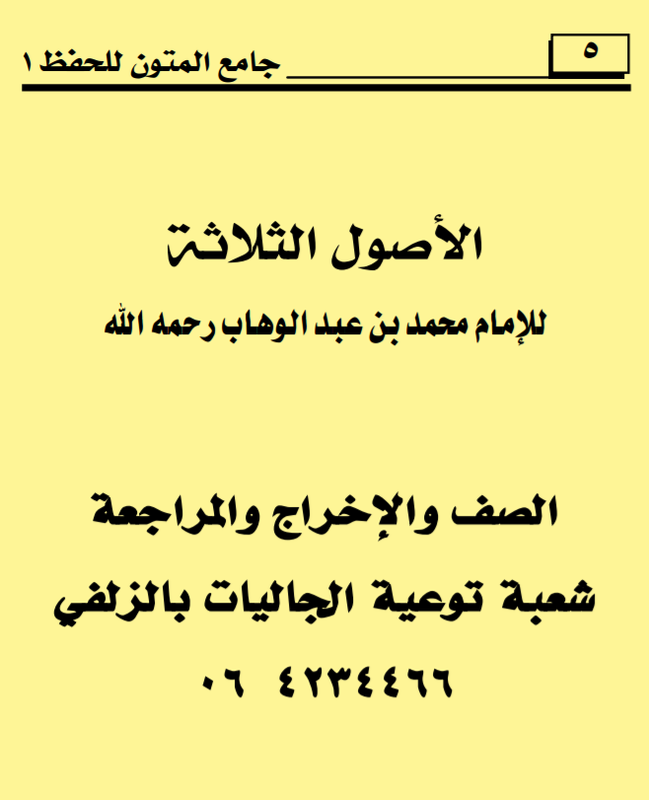 The first class provided an overview of the book and a brief biography of Ibnul-Qayyim (see: Salafi Publications: A Brief Biography of ibnul-Qayyim ). 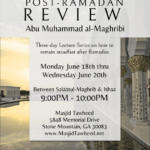 Taught at Masjid Tawheed on Wednesdays after between Maghrib and Ishaa Salah by Abu Muhammad al-Maghribi.